Get involved with life issues! Abortion, euthanasia, assisted suicide. These are areas of concern that EWTN Pro-life weekly seeks to inform and engage on life issues. Visit the series page for more information! Going to the March? Take us with you! Can't be there in person? 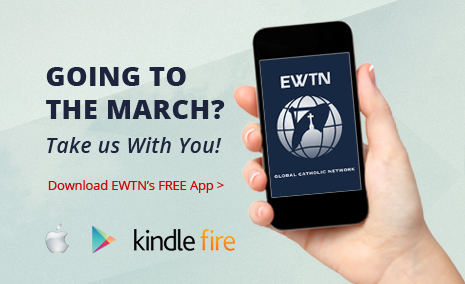 Show your support on our Facebook page, www.facebook.com/ewtnonline using the hashtags #EWTN, #whywemarch, #marchforlife and #prolife. January 18 at 9 and 10 AM ET, January 19 at 12 AM ET, and January 20 at 11 AM ET - Live and complete coverage of the most important pro-life event of the year: the annual March For Life. in Washington DC. Get caught up on the latest Pro-life issues in the news. Here you'll find an array of articles and the newest updates concerning leaders and topics in the Pro-life movement's stand against abortion, euthanasia, and other threats to the sanctity of life. Looking for pro-life media? Browse and watch some of EWTN's featured pro-life television programs, including documentaries, interviews, teaching mini-series, and our coverage of the National March for Life.